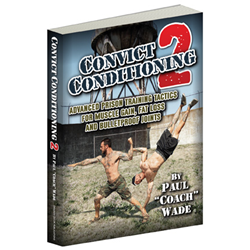 Convict Conditioning 2 is Paul “Coach” Wade’s follow up to his widely successful, first book “Convict Conditioning” that got rave reviews. The original Convict Conditioning book is one of the top rated strength and fitness books on Amazon.com (at the time of writing). This is an impressive feat as the entire book is based around using your own body weight to develop functional, real world strength. This is something that is often overlooked in a day and age where guys are chasing “perfection” by lifting weights. These guys seem to be much more concerned with how their muscles look than how they function in the real world. I call these muscles “mirror muscles”. They may look good (depending on your definition” of good) but they sure as hell aren’t functional. They are not going to help you overcome “real world” physical challenges. The original Convict Conditioning gave readers a complete progressive system for body weight training that would help them develop strong and functional muscles and a shredded physique. It also drilled home some outstanding mental principles that should be installed into every fitness enthusiast. Convict Conditioning 2 holds true to this methodology. Wade uses the same principles to target the ares of the body that were not covered in the original book. If you read and enjoyed the original, you will definitively enjoy Convict Conditioning 2. Likewise, if you have any kind of interest or background in Plyometric, Isometric, or Calisthenics training you will enjoy this book. Let’s take a look at Convict Conditioning 2 and let you know what to expect. Yep…its bloody good! What’s in it?….Keep reading and I’ll tell you…. Paul “Coach” Wade hit a home run with the original Convict Conditioning book, and I would give him a bases clearing triple with his follow up attempt. Convict Conditioning 2 takes us a bit deeper into the realm of the ultimate form of training just using our own bodies. You will continue to learn many advanced training principles, exercises, and functional strength methods. Just like his first book, Wade delves into the principles of Anatomy, Physiology, and Kinesiology. He ties in all 3 of these concepts and breaks down some really advanced body weight training designed to build muscle, strengthen tendons and ligaments and give you the ultimate male body. As with the original, Wade details how, though Calisthenics alone, you can achieve the ultimate male body without the need to lift heavy weights and spend hours in the gym. To Wade though, the “ultimate male body” is merely the result of training hard to survive in a hostile environment (prison in his case). The principles and science behind both the original and his follow up Convict Conditioning 2, shows you that Paul “Coach” Wade should be acknowledged as one of the world’s leading experts in Calisthenics. His advanced training principles, exercises, and progressive system tie in perfectly with the science and mechanisms of developing functional strength using nothing but our own body weight. To give you an example, check out the video below. Its from the Convict Conditioning Pushup DVD series. As with the original Convict Conditioning book, there is nothing I don’t like about this book. It really is fantastic. It is amazing that we posses everything we need to sculpt the ultimate body – yet so few of us reach our potential. No longer do you have the excuse of not having the time or money to join a gym. All you need is your body (and a bar) and the Convict Conditioning principles to get the job done. If you want a book that has a very similar philosophy to training, you should check out Raising the Bar and Pushing the Limits by Al Kavadlo. They are both good books but in my opinion not quite as good as the Convict Conditioning series, if only because the workouts supplied are not as in depth as the ones in Convict Conditioning. Just out of interest sake, you may be interested to know that Al Kavadlo and his brother Danny, who are both well known Calisthenics trainers themselves, actually model many of the positions in the Convict Conditioning 2 book! In fact, that’s them on the cover! Anyway…back on topic. As with the original Convict Conditioning book, Convict Conditioning 2 is available in both eBook and Paperback versions on Amazon.com. If you were a fan of Paul’s first book, then Convict Conditioning 2 is a must read as it takes you further on “functional strength” journey. After reading both Convict Conditioning and Convict Conditioning 2, you will have incredible knowledge of functional strength and calisthenics. You just need to apply what you have learned. Follow through and you will develop incredible levels of functional strength and a body to match! Feel free to leave your thoughts in the comment section below. Want to stay up to date with whats going on at Strength and Stability?….Sign up to our newsletter below. Click here to return to the Strength and Stability homepage. Very good article! I agree, the best ways to build strong, functional muscles is by primarily using your own body weight. Guys always talk about goin’ to the gym, how much they can lift and yada yada yada…me n my sons stay home n do push-ups, pull-ups, sit-ups, jump rope,, and use dumb bells,, that’s really all ya need to get in shape! The book sounds interesting,, might have to check that out! Thanks for the info!